While filling online form for ibps, railway, ssc or any other such examination forms, you might have faced the problem of reducing image size for uploading as they demands very small file size for uploading. Not having knowledge of photoshop or any other photo editing software creates problem for reducing image size. Sometimes the in reducing the size of the image people starts to decrease the dimension of the picture and in doing so they end up with a tiny image (though they are able to reduce the file size) which appears blurred when uploaded. Or you might be facing low memory storage problem due to RAW images taken by your DSLR camera or any high mega pixel cameras. Because these cameras produces pictures of size greater than 4 MB, it becomes difficult for us to store all the images. We have to delete the images time to time or buy extra memory cards or storage devices for storing them. There are many ways to reduce the file size of an image by using online tools. But the problem is that they require us to upload our image to their website and who knows what they can do with our pictures, its not safe. And also it is necessary to have an internet connection for this. So, today I am going to show you an easy way of how to reduce image file size without affecting its quality. This method is completely offline method that mean you don’t need an internet connection for this. Using this method you can even reduce a 7 MB picture to 1MB without compromising its quality and its picture dimension. Step 1: If you are using operating system other than Windows XP then install VMware or any other virtual PC and install Windows Xp on it. Step 2: Once Windows Xp is installed then copy the image whose file size needs to be reduced in Windows Xp. Step 3: Now open the image in Ms-Paint in Windows Xp. Step 4: Once the image is opened in Ms-Paint, just Hit Ctrl+S or Goto File>Save (Save the image). And that’s it. You don’t have to do anything else. The size of the image will reduce automatically. I discovered this method accidentally while I was trying to edit some picture using Ms-Paint. Here is a video reference for the above steps. 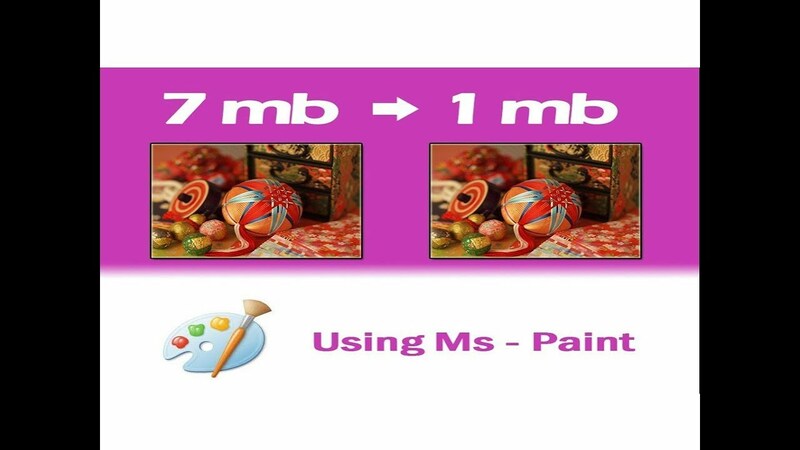 In this video I have shown how you can reduce a 7MB picture(jpg) file to 1MB . Hope you like the article. Leave comment below if any query or doubt.